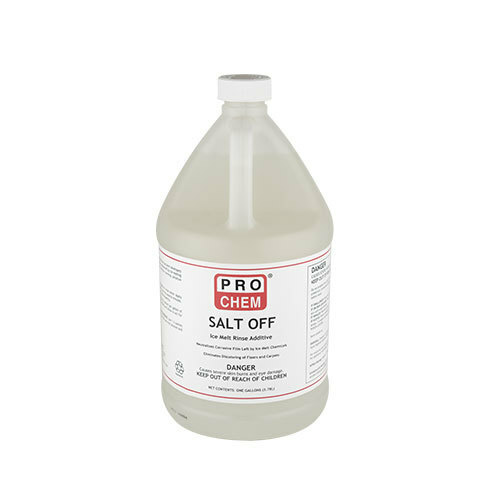 SALT OFF | Pro Chem, Inc.
SALT OFF is an industrial-strength rinsing compound that was specifically developed to cut through the dulling, white chalky residue left by ice melting chemicals. It rapidly dissolves salt residue without harming sensitive painted or finished surfaces. This rinsing compound can be applied to equipment, mopped onto floors or used in carpet cleaning machines. It is safe for use on any metal, asphalt, concrete, plastic or painted surface. To remove heavy film from equipment: Dilute 6 oz. per gallon of rinse water. Spray liberally over equipment surfaces. Rinse immediately with clean water. For daily damp mopping: Use 1 to 3 oz. per gallon of rinse water. Apply liberally to floor with a mop. Rinse immediately with clean water, wringing mop out frequently. To eliminate carpet stains left by ice melting residue: Use 1 to 3 ounces per gallon of water in carpet extraction equipment. 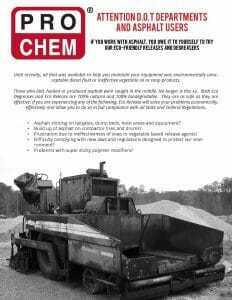 Do not use a hot solution and do not mix this product with any other chemical. Note: This product can be used on cobblestone, as long as you dilute properly and rinse properly. Simply spray on and allow to penetrate, then rinse off.